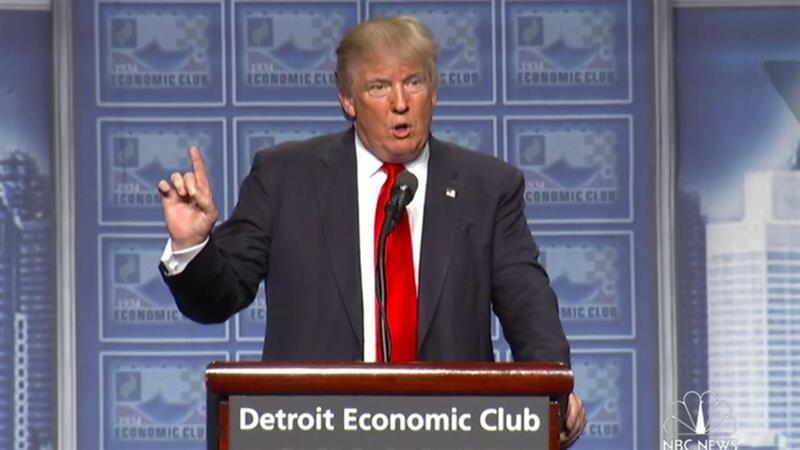 Republican presidential nominee Donald Trump gave a speech on the economy Monday afternoon from Detroit, Michigan. The billionaire businessman addressed business leaders at the Detroit Economic Club at 12 p.m. ET. Trump, who was joined by his running mate Indiana Governor Mike Pence, proposed tax breaks for working families, as well as corporations. His plan is also expected to impose a temporary moratorium on new federal regulations and reviving Transcanada Corp's Keystone pipeline project. Trump's rival Democratic candidate Hillary Clinton is expected to deliver a speech on the economy from Michigan on Thursday.